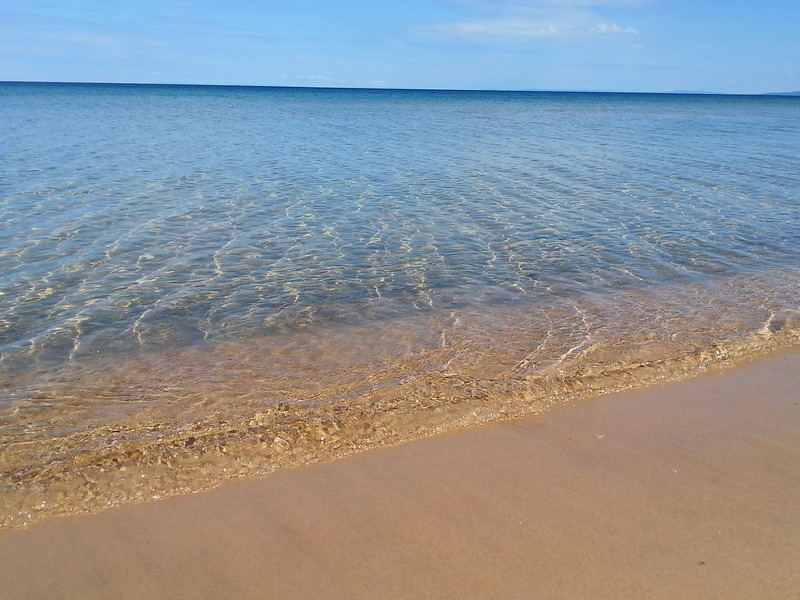 “If you seek a pleasant peninsula, look about you.” official state motto of Michigan. 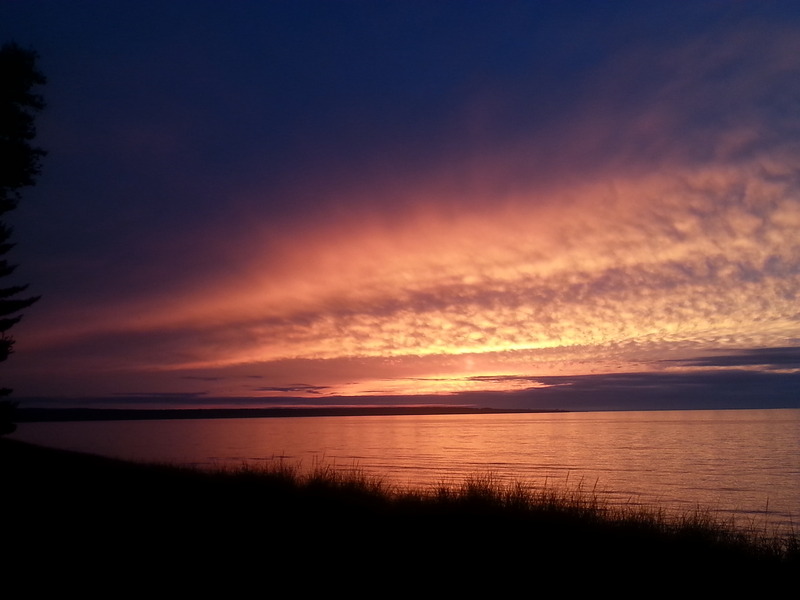 We are looking, and like very much what we see here in the Upper Peninsula. Our original plans were to cross the Mackinac Bridge, (painted in green/white, the colors of Michigan State University. Go Spartans! ), then head directly to Tahquamenon Falls. 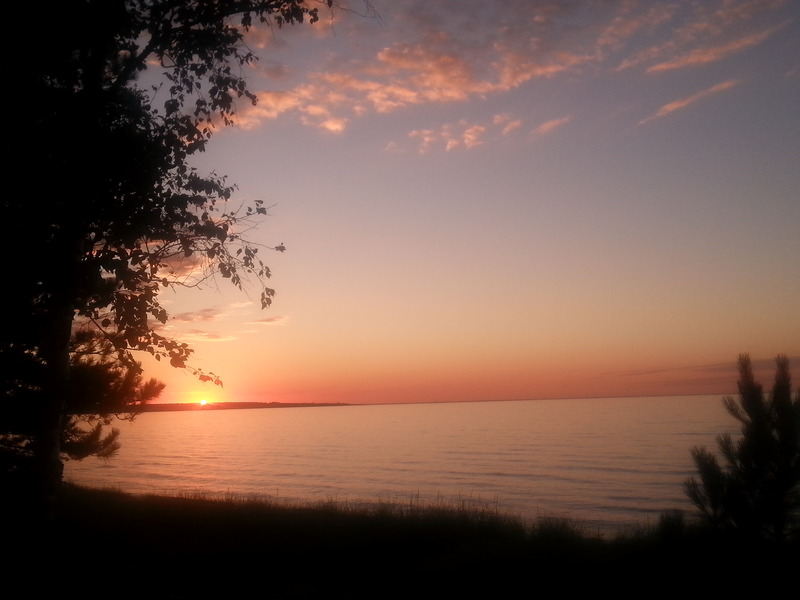 We got sidetracked after consulting our Michigan’s Best Campgrounds book, and decided to head for a Bay View Campground, in the Hiawatha National Forest, instead. A wise choice. Can’t imagine having a more perfect campsite. Anywhere. 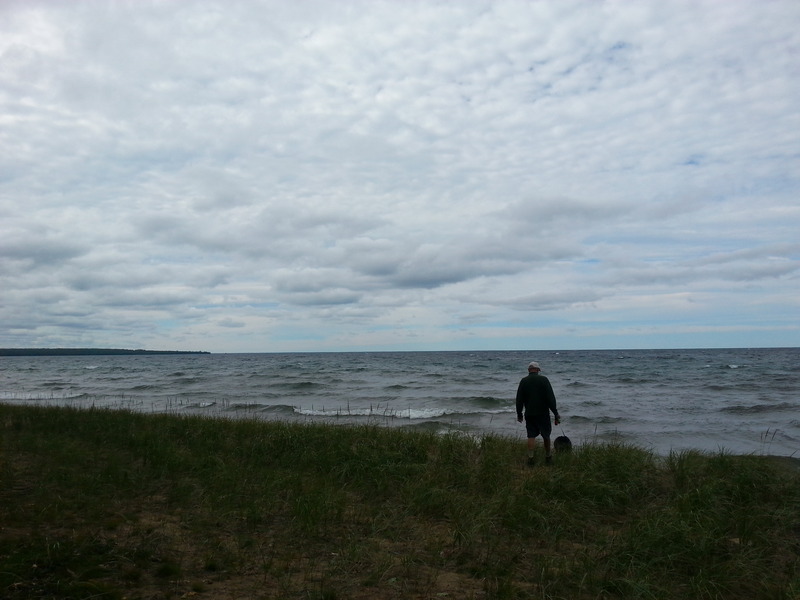 We are perched right on the shore of Lake Superior, in a huge spot. Lots of space separates our fire ring and picnic table from the Fireball. 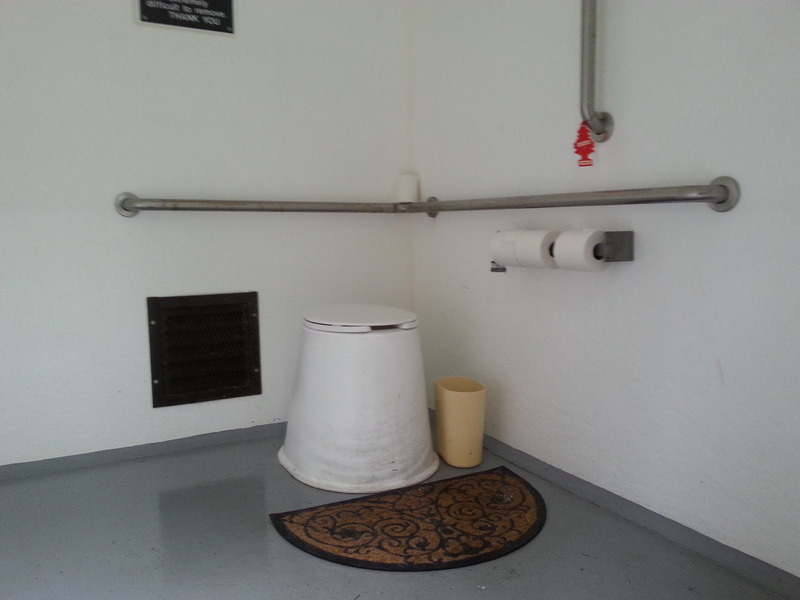 Being a National Forest Service campground, there are only vault toilets, but check this out… The gleaming toilets here have floor mats, not one, but TWO strawberry-scented air freshners. Immaculately clean. 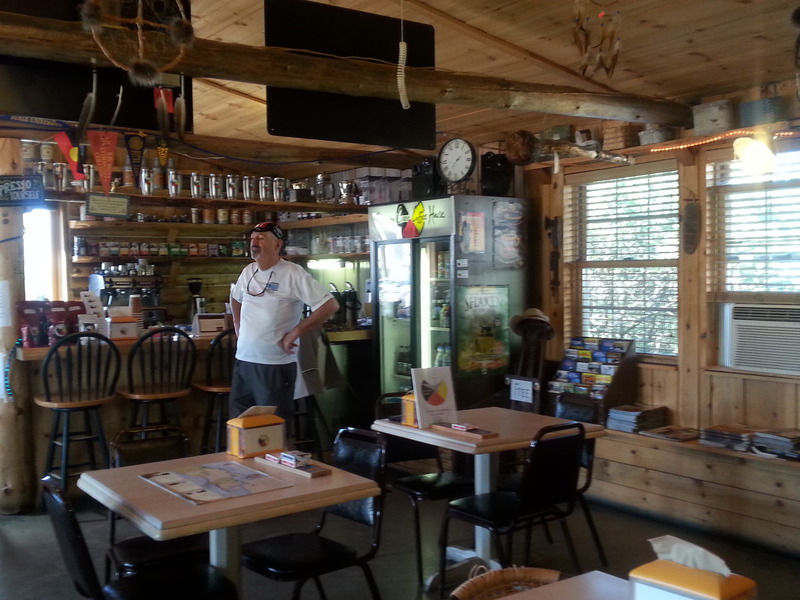 John, the Camp Host here for seven years, treats this small campground like his own home. We are privileged to stay here. Our original two night plan evolves into four beautiful days. The Whitefish Bay National Shoreline is a perfect spot for a bike ride, so we headed east toward the Point Iroquois Light Station, constructed in 1870. There’s a small museum, a terrific volunteer host (who bakes homemade treats for visitors on Saturday). We huffed and puffed our way up to the top of the tower, where we were treated to views of freighters lining up to pass through the Soo Locks. (sidebar…..we were entertained by our Google Navigation on the way north. The Google Lady, as we affectionately call her, referred to Sault Ste Marie (pronounced Soo Saint Marie) as Salt S-T-E Mary). We liked that. We cycled through Brimley SP, and checked out the Wheels of History railway museum there. 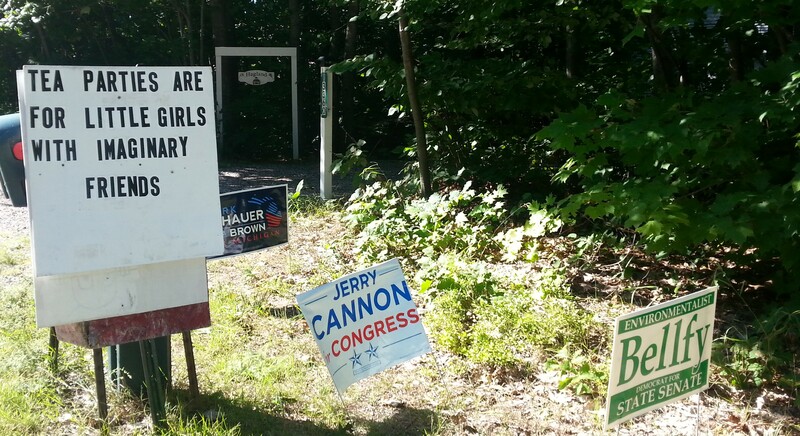 You have to love the old lady volunteers in small towns everywhere who keep these places going. There was a spaghetti dinner planned, along with a quilt raffle, and 50/50 drawing. Lots of interesting artifacts and photos of the CCC days. We looked for John’s dad in the photos, as he worked in the UP for a couple of years in a CCC camp, but didn’t see anyone who looked like him at all! 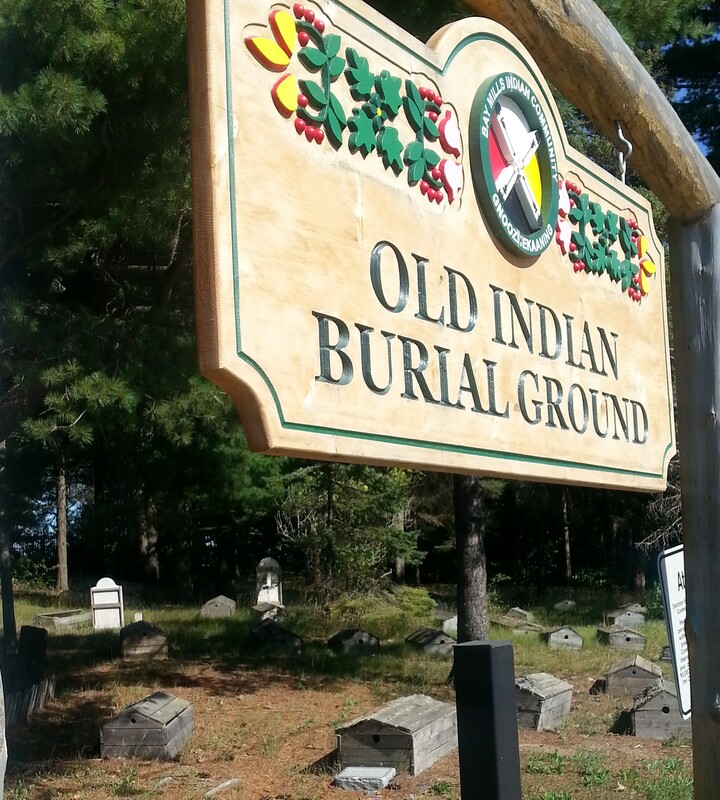 An interesting old Indian cemetery caught our eye. The above-ground structures all had identical little round holes in the west side. A spot for the spirit to leave? We don’t know. Coffee at the funky Dancing Cranes Coffee Shop in little shop Sights along the road that answer the question “What is UP humor?” (The top mailbox says “credit card bills”, the middle says “winter mail”, and the bottom one “summer mail” But what we will carry with us is the fierce beauty that is Lake Superior. Its stark majesty is breathtaking. We are so fortunate to live here. 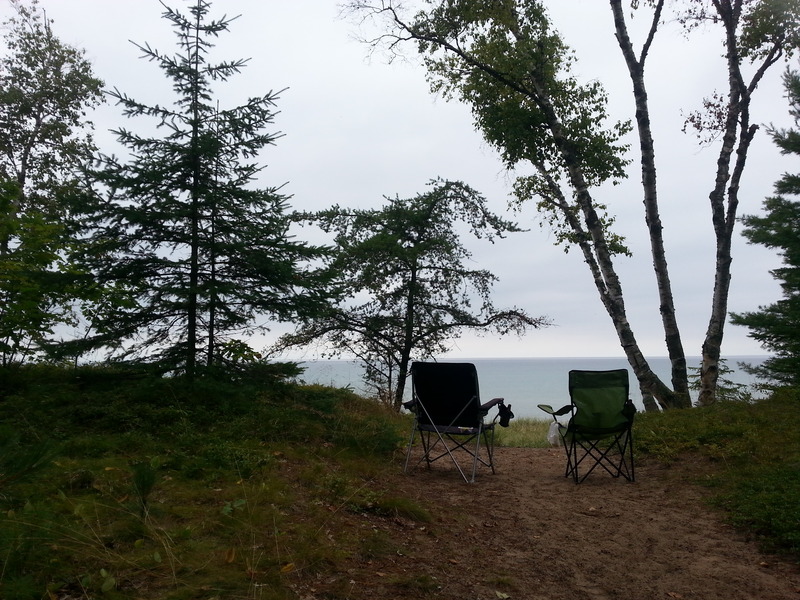 This entry was posted in camping, cycling, Michigan, national parks, retirement, simple camping, T@DA and tagged camping, historic sites, Lake Superior, Michigan, national parks, road trip, simple camping, T@DA, the great outdoors by Judy Crankshaw. Bookmark the permalink. Omg, Maria! I can’t believe that I didn’t catch my error. Its tgat correct/delete thing that gets me every time. We are Spartans!! Of course there is no such place as Michigan University. What a moron I am. Gonna go back and correct that right now. A thousand thanks. But mostly, I loved that gorgeous campground and scenery. 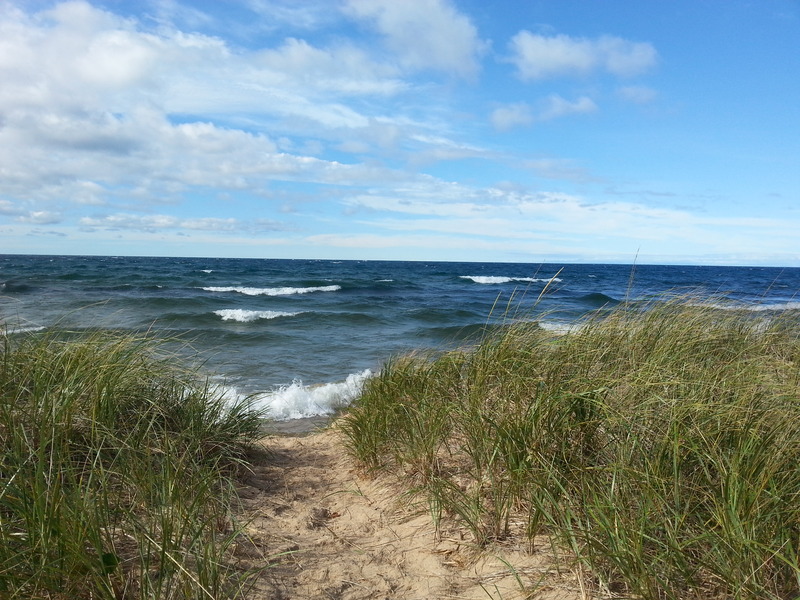 I could happily have stayed a month in that campground, reading, and listening to Lake Superior roar. Thanks for checking in. Hope you are planning your next trip. I am so very glad the Campshaws are back on the road sharing photos and stories and their passion for travel! Have fun, be safe!! Thanks, Sharon. No one is happier to be on the road than we are! 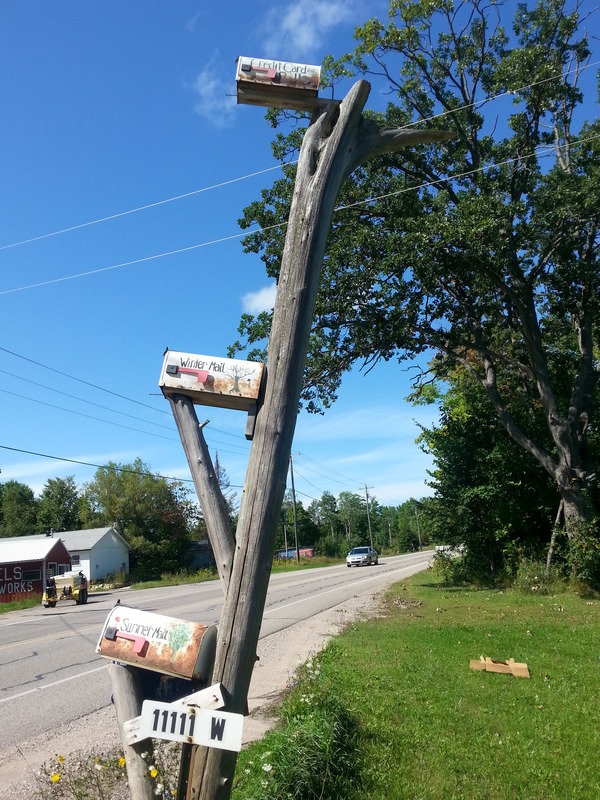 Love the mailboxes and the SIGN!!! I LOVE that bridge…you come over the hill and there it is. Glad they make you slow down, easier for the looker :) One fine campground…a seven year host!!! I’m so glad you’re are back on the road! Thanks, Carla. We are happy to be on the road again. This trip will be fun, because we’re covering ground where neither of us has traveled much before. All new can’t be all bad, can it? Judy, the state should have you on their payroll for promoting them! There are indeed beautiful places throughout the state. As a former Michigander, it makes me just a wee bit homesick! Enjoying your travels! Thanks, Sandi. Come on back to Michigan sometime. Even tho you’re a big New England Patriot fan, we’ll still let you in! I think it’s strange that I’ve lived my entire life in this state, but have only been in the UP three times. Glad we are finally exploring a bit of our own home state. There’s a lot to see. Breathtaking views. We are indeed most spoiled in the beauty and variety our state offers at every turn. 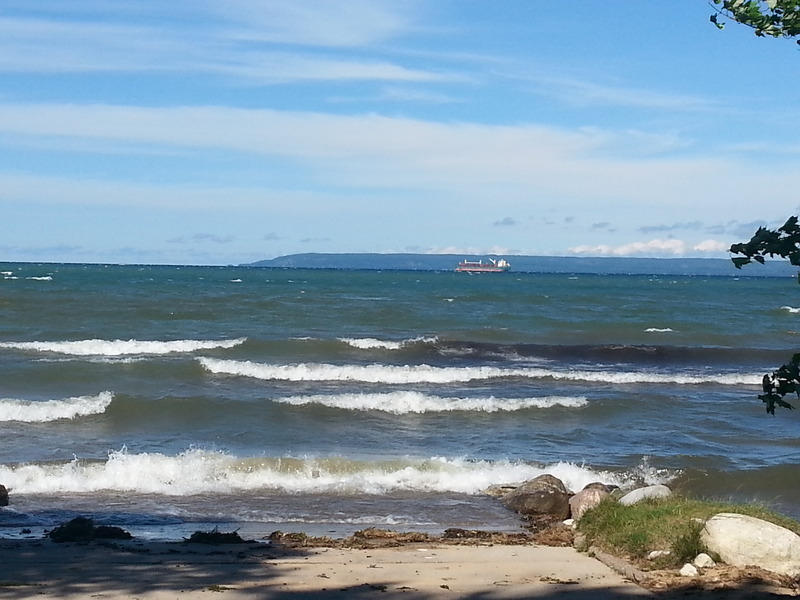 The power of Lake Superior boggles my mind. Thanks for sharing. Sometimes, I think that it just can’t get any better, then it does! Always something new to see. Thanks, Alison. It is indeed a wonderful state, with so much to see and do! As much as I’ve roamed Michigan, the only place from this post that I’ve been is the Bridge. It’s a different world north of the bridge. Lots of extra space. Was wishing that I had your eyes and ears though, Jerry. Seems like I’ve seen very few birds other than bluejays and seagills. Hope you get a chance to cross the Bridge soon. Beautiful indeed. 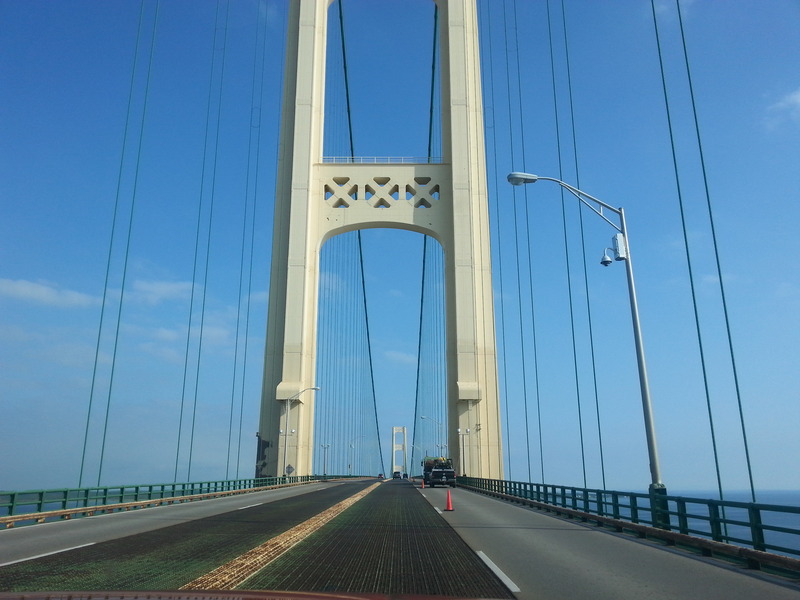 With all the mountain driving I do, you’d think I wouldn’t have any trouble crossing the Mackinac Bridge…… I was white knuckling the entire length lol. I had to laugh at your restroom photo. Those of us that travel a lot, have a true appreciation for the extra effort that the camphost provides. Were the campsites at Bay View CG large enough to accommodate a 31′ fifth wheel? Ingrid, you could put a 40′ fifth wheel in most of these sites. They are amazing. Our trailer is 18′ (including the hitch), and we left our truck hitched up. Have at least 10′ to spare. We’ve been in campsites with the good, bad, and unmentionable. This one was great! I bicycled across the Mackinac Bridge several years ago, and that was a white knuckle moment for me! Driving, or being a car passenger doesn’t bother me, though. Bad bathrooms have their own special place in hell. Good ones like this are all too rare. I could have kissed the camp host. There are 23 sites here + a few walk-in tent sites.. Most would accommodate your 5th wheel, many without unhitching. We kept our little rig hitched to our pickup, and had room to spare.